Rajasthan Royals slumped to yet another defeat, this time a 12-run loss to KXIP last night at Mohali. With the defeat, Rajasthan are most likely out of the running for a spot in the playoffs. 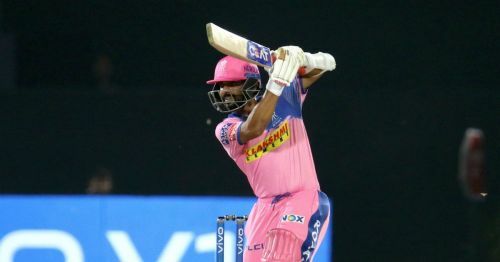 Former cricketer and commentator Sanjay Manjrekar has laid the blame at RR skipper Ajinkya Rahane's feet, claiming that he is living in denial with regards to his batting form. Rahane has struggled this IPL, scoring just 201 runs from 8 matches with one half-century. Being a crucial member of the RR batting lineup, his lean run of form has adversely impacted his side. Coming to the international circuit, Rahane has struggled to nail down his spot in the limited overs formats and finds himself out of the ODI and T20 teams. Relatively younger talents like Vijay Shankar, Manish Pandey, and Ambati Rayudu have gone ahead in the pecking order and there seems to be no coming back for Rahane. Sanjay Manjrekar recently claimed that Rahane 'is living in denial about his batting form' and that only when he accepts that there are problems with his batting will he focus on eliminating them. After a string of disappointing scores as an opener with Jos Buttler this season, Rahane demoted himself down the order to #4 last night. He struggled his way to a painstaking 26 off 21 balls, failing to provide RR with the required momentum in the back end of the innings and contributing to their defeat. Rajasthan Royals took the brave decision of leaving out Steven Smith yesterday, but considering Rahane's form, will the captain decide to ultimately drop himself for the benefit of the team? Manjrekar was spot on when he said that Rahane is living in denial. A batsman who possesses such a solid technique and variety of strokes should have ideally been pushing for the #4 spot in India's ODI team ahead of the ICC Cricket World Cup. But he has been very inconsistent in the past few years and has relinquished that position for good. Rahane has only himself to blame and it's about time he introspects and goes back to the drawing board. The question, though, is will he?